Over 70 producers recently attended an information day at Brian Pastures Research Facility to learn about early stage results of the Meat & Livestock Australia (MLA) funded Repronomics project. Presentations and animal demonstrations were designed specifically for producers who have contributed to the project through their seedstock. The information day gave producers the opportunity to gain insights to trends that are developing, as well as seeing firsthand the progeny bred at Brian Pastures from their herd genetics, which is a result of the past three and a half years of operation. 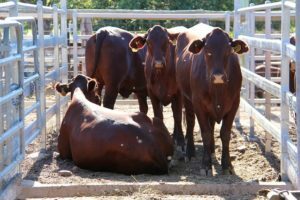 The Repronomics project is focused on enabling reproductive performance of beef cattle breeding herds in northern Australia. The project uses a combination of industry herds and the existing beef research herds located at Brian Pastures Research Facility, Gayndah and Spyglass Research Facility, Charters Towers in Queensland, and the highly recorded selection-line experimental Brahman herd located at Douglas Daly Research Station, Daly Waters in the Northern Territory. The key aim of the project is to improve the accuracy of genetic selection systems through strategic phenotypic recording and new high density Single Nucleotide Polymorphism (SNP) genotyping. The project focusses on three breeds, Brahman, Droughtmaster and Santa Gertrudis. The project includes an artificial insemination (AI) program focused on the use of highly influential sires that have been used extensively in industry, aiming to improve the accuracy of their breeding values through recording their daughters as a reference population. 3000 cows have been inseminated through the fixed time program. In conjunction with the AI program, a natural mating program is also run, focusing on the use of young up-and-coming sires to improve the accuracy of their Estimated Breeding Values (EBVs) as they enter into industry. The project closely monitors the reproductive performance of female progeny from weaning, through their pubertal period, and as they enter the breeder herd, to determine critical traits such as age at puberty, first-calf cow anoestrous interval, and calving and weaning rates. Key note speaker, Dr David Johnston outlined that with weaning rates in northern beef production as low as 50%, especially in first calf cows, the key profit driver in the northern beef industry is cow weaning rate. It is critical that a higher level of accuracy is reached on the key Days to Calving EBV to influence reproductive performance in order to increase profitability. Santa Gertrudis maiden heifers, daughters of the AI sire ‘Wightfields Crackerjack’ C75. The attendees were presented with displays of sire progeny groups from each of the three breeds, including heifers, steers, and calves at foot from the latest sire intake. More than 400 head of cattle were on display and provided a comprehensive overview of the magnitude of the project, as well as some early results on the large differences in female reproductive performance of the sire used. Scanning demonstrations displayed the techniques used in live carcase scanning, as well as key technologies used in identifying a Corpus Luteum, enabling the detection of puberty and re-cycling in breeders. The day concluded with an update on the progress of the development of the new BREEDPLAN single-step evaluations. This new technology allows producers to take a hair sample from any animal and send it to the DNA lab. This provides information on increased EBV accuracies for growth, carcase quality, and importantly, reproductive performance of the animal, especially if these animals are genetically related to the genetics used in the Repronomics project. This cutting edge technology has recently been released for the Brahman breed, and the next stage for this technology is increasing the level of genotyping, obtaining more high quality phenotypes, and improving the evaluation and adoption of these methods. The Repronomics project is a collaboration between MLA, the University of New England’s (UNE) Animal Genetics and Breeding Unit (AGBU), Queensland Department of Agriculture and Fisheries (DAF), Northern Territory Department of Primary Industry and Fisheries (NTDPIF), Queensland Alliance for Agriculture and Food Innovation (QAAFI), and the Agricultural Business Research Institute (ABRI).